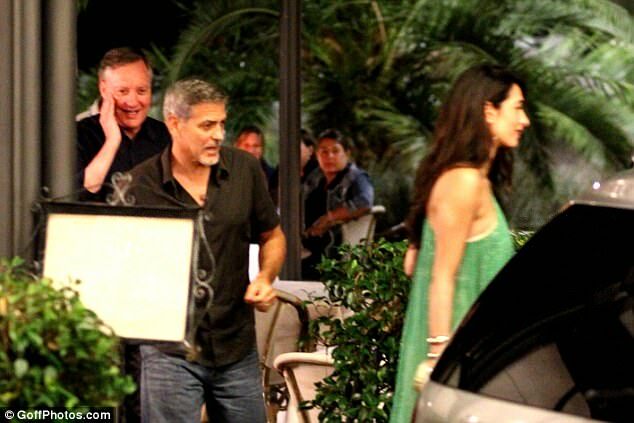 Amal Clooney was beaming when she and her greying husband George Clooneywere photographed hand in hand of a Sunday evening in Cernobbio, Italy. The pair - a 39-year-old barrister and her 56-year-old movie star spouse - were enjoying an outing in the area around Lake Como, where one of their homes is. Amal, who gave birth to the couple's twins Ella and Alexander this June, wore a shimmering and flowing sleeveless lime green maxi-dress and hoop earrings. Meanwhile, the Ocean's Eleven star had buttoned himself into a half-sleeved black shirt and pulled on jeans, completing the ensemble by way of sand-colored shoes. Before marrying Amal, née Alamuddin, back in 2014, George had spent 1989 until 1993 married to an actress, one Talia Balsam, though without any resultant children. WTF!? She stole my shower curtain! 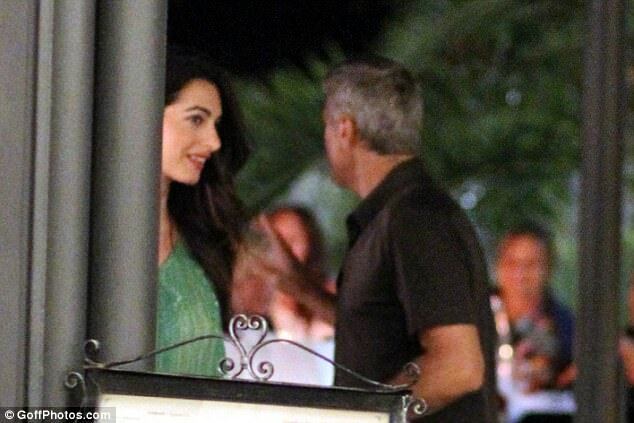 Just realized another reason the other dinner pics didn't go wide: can't really see what Amal's wearing. Referring to previous discussions, that dress does not seem compatible with current breast feeding. Also a question: I'm in the US and it seems to me that interest in George has waned a lot. Anyone else get that impression? Could be that we are just consumed with politics/ more important issues than celebrities. May also be that I personally have stopped paying attention. Yeah, I doubt she's breastfeeding. Her breasts aren't as big/full as they should be for nursing/pumping for two new babies, and she's spending an awful lot of time getting ready/out/going home. And, yes, I think general interest in George has waned. He's aging out of popularity, he's not the romantic 'player' he once was, and he hasn't had a mass hit (like the 'Ocean's' series in a while. Besides which, he's mostly out of the States these days. There certainly are more important things to worry about than celebrity lives. By the way: I'm quite amused that some gossip websites / magazines seem to realize that George's hair has greyed and that he looks tired. Because, as we all know, his hair was dark back in spring . And in the pics with them in tennis dresses, Amal looks very tired as well. Maybe they try to get away the paps' attention from their babies by showing up in public, try to 'feed' the paps. And if they just do it to promote 'Suburbicon', I'm fine with that as well. Because, if you remember, they weren't seen for months before and shortly after the twins were born. Now just think about George not to be seen in oublic before the Venice Film Festival, I'd call that exhausting! Way2Old4Dis wrote: And, yes, I think general interest in George has waned. He's aging out of popularity, he's not the romantic 'player' he once was, and he hasn't had a mass hit (like the 'Ocean's' series in a while. Besides which, he's mostly out of the States these days. I mostly agree with you, but I wonder if some of the lack of interest stems from the fact that he's taken himself out of the public eye for the last few months. I also wonder if this might not hurt his image. You know how when you see someone all the time you don't notice that they're aging half as much as when you haven't seen them for a while. Then when you do see them, the difference in their appearance is striking. He looks good the same . The same stinky t-shirts . According to a source, the pair was in a "happy" and "loving" mood as they exited around 11:30 p.m with friends and a mild amount of security. Unfortunately, not much romance in movies about older people (or even that many about older people). You would think as the population ages, you could catch the demographic trend. I'd line up to see a movie with George as a sexier older leading man! Thanks PAN for IDing their guests. The guy walking behind George looked familiar but I couldn't place him. Yea I think the Daily Fail started this line that George is exhausted from becoming a dad and other sites have picked up on it. Shortsighted on their part. George doesn't look much different than before becoming a dad. There are many times when George looks tired. He's gotten a lot grayer in the last few years. But his hair does look much whiter in the pics of him in his tennis garb. Bright light probably washes his color out quite a bit. I too think interest in George has waned a bit in the states. He may generally be more popular in Europe. He hasn't been on the big screen that much. Where other actors are putting out maybe two or three films a year, George isn't. No more tabloid talk of George as a single guy dating various women with the media wondering if he's ever gonna settle down. I like the dress it looks cool and comfortable and I agree it would be nice to see an adult romance with George in the lead. Right on target, Sevens. Let the media blitz begin. Oh no... Gio has caught George's baggy jeans virus. Sevens wrote: According to a source, the pair was in a "happy" and "loving" mood as they exited around 11:30 p.m with friends and a mild amount of security. What are they supposed to say---- ie: he was half in the bag and she was pissed???? His hair looks much darker in that last picture. Could be the lighting - or maybe Waldo worked some magic after the tennis match. I wonder who's going to go to Venice. George alone? G&A? G&A and the twins? Maybe the twins will stay home with the 2 grandmas while G&A take a few days off diaper duty. LizzyNY wrote: His hair looks much darker in that last picture. Could be the lighting - or maybe Waldo worked some magic after the tennis match. Venice is just a quick plane ride away from Como, right? I think I remember he and Eli (maybe Stacy) flying in on a helicopter, so it can't be far. Maybe just in for the day of the premiere and back home? The twins will only be three months; that's young to leave them overnight, IMO. Mm, Venice is a three hour drive (remember the door-to-door coach trip for Gravity with Sandra Bullock) but a hell of a lot quicker by helicopter or private plane and Lugano airport is literally just up the road. 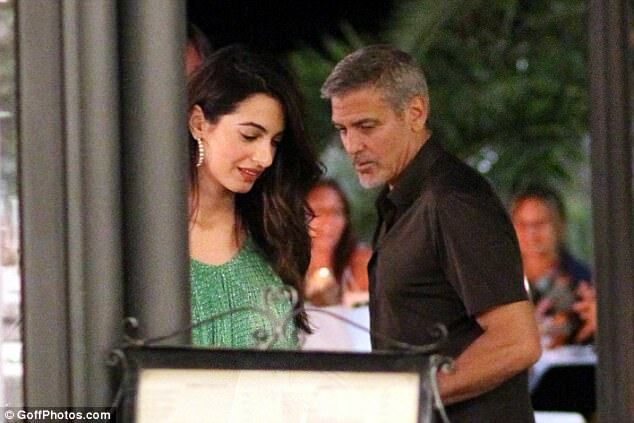 George also needs to join the TIFF after Venice. Don't know if Suburbicon is scheduled in Toronto yet, but the Biennale is from August 30th to September 9th with Suburbicon on September 2nd (by the way: tickets are still available if anybody's interested). The TIFF is scheduled from September 7th to 17th. Suburbicon press conference is of Friday, 8th, screening on Saturday and Sunday. Actually I can't imagine him taking the twins to Northern America, unless they plan to spend time there anyway. He will be too busy to spend time with them (and would maybe like to get some sleep as well...). A lot going on for George in the next few weeks with these film festivals. My uninformed guess is that Amal may show up for the Venice event (since she won't be far from their Como home) but that she won't go to Toronto. Logistically with two babies it just seems a lot more complicated. But I've been wrong before. that's my thought as well. To leave the babies with people they really trust may work for Venice, being able to fly home within 30 minutes (which won't take longer than heading to Cernobbio and other places around the lake by boat). If the twins are really easy to handle and don't mind a break of their daily routine including the time lag, it may work to take them to Toronto. Which includes a stay at a hotel, lots of people getting to see the kids and take pics of them (which, of course, just makes problems if they plan to 'hide' them), not being able to go out with them for a walk themselves because hotels usually don't have large gardens. The nannies were seen when leaving the plane (if they actually were the nannies which we don't know). But I guess that, if the paps knew they were in Toronto as well, every twin stroller would be suspicious, especially if the person pushing it would have a cocker or basset hound next to her as well... (I know, of course they could use single strollers as well). My guess? I think she'll do a quick trip for the premiere and then straight back. I don't see the family doing Toronto - in fact, I think they might move back to London fairly soon. A shorter trip across the pond for Daddy. I also think she will go but head straight back to the babies. I think George will go to Toronto with Grant.